What to you is Easter? Easter may also mean: To Change For The Better. And when the better you has reborn, then Easter Sunday should be really celebrated! That's why, last Sunday, our family started the celebration by first attending a mass. We had lunch afterwards at Seafood Island in Robinsons Magnolia (review to be posted soon). Boracay Feast Boodle good for 3-4 persons was what we ordered. The boodle experience was something that my elder son enjoyed and look forward to do again. Since my kids were aware that it's Easter Egg Hunting day, as soon as we sat down, they started looking for hidden eggs all over the place and got four. Among the long list of Easter Egg Hunting Events I posted in this blog, we decided to bring the kids to Robinsons Magnolia for their Toys R' Us Easter Egg Hunting activity. A purchase requirement worth Php 500.00 from Toys R' Us for a child aged 4 to 10 years old to participate. 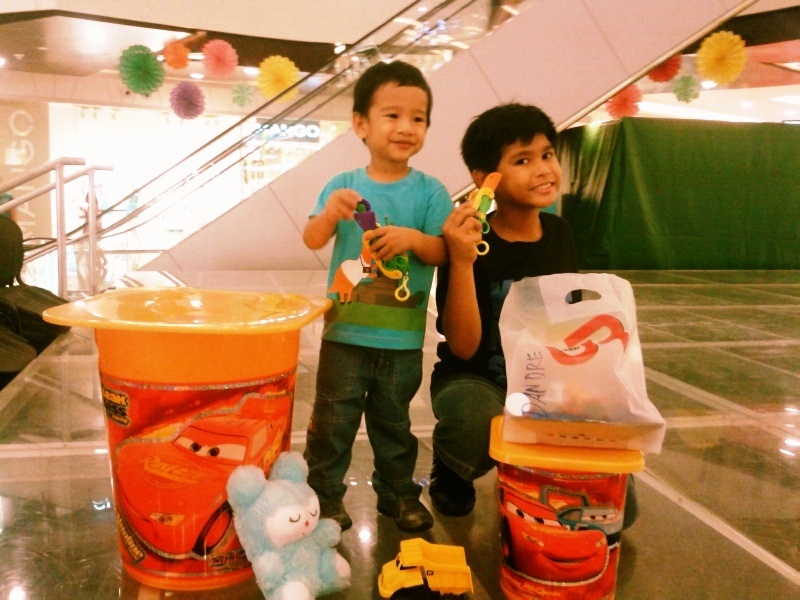 Knowing that only my elder son could participate, the toys that I bought were for my toddler. The Easter Egg Hunting in Robinsons Magnolia was limited to 200 children only. Their registration was organized and each kid received an activity stamp and a number participant tag. The whole activity started with a Mad Science Show where my son volunteered in two of the many experiments. I always encourage him to volunteer in activities and not to be shy, just go for it. He made me really proud. I commend the organizers of the activity because they divided the egg hunting to two main categories, the younger and the older kids. Each participant was given a bag for the eggs that they will be able to hunt. In the photo above, the hunt has begun for the little ones while the other kids were waiting for their turns at the starting line. While waiting, my almost "binata" or tweener took photos with the roaming mascots. He's really still a kid and I am happy about it. When it was my son's category's turn, I cheered for him and really was excited for him. He likes activities such as this, running and hunting with other kids. He can become really competitive. But what's important is not really winning it, but the experience and that he enjoyed it. I'm sure he enjoyed the thrill of hunting for as much eggs as he can in only 60 seconds. He got a lot, but other kids got a lot more. He was a little disappointed at first and anxious what prizes he got from those eggs. We were told from the beginning that there were eggs, especially the large ones, that contained the major prizes. Meanwhile, while waiting for the accounting of the eggs and awarding of the prizes to the participants, I picked up my toddler from Jump Bounce and Play where I dropped him off with his yaya while the Easter Egg Hunt was commencing. When we came back for my elder son, he was on the stage with his prize and he almost shouted when he saw me to announce that he got one out of the four major prizes. I was so happy for him because he really enjoyed it! Thanks to Robinsons Magnolia and Toys R' Us for the activity and the prizes. It was pretty obvious that the kids enjoyed it. Congratulations too for the success of your event! How about you, how was your Easter Sunday? There's no boring area talaga sa Pinas. There's always something to look forward to.